Tonight we walked downtown for dessert, but as it was lateish Sunday evening, we found few desserty-type or coffeehouse-type establishments open for business. So we stopped by the co-op and acquired a couple of desserts to be schlepped home and consumed over decaf. My husband accused Carolyn of being selfish because she got the last creme brulee in the case instead of buying a larger dessert we could all share. 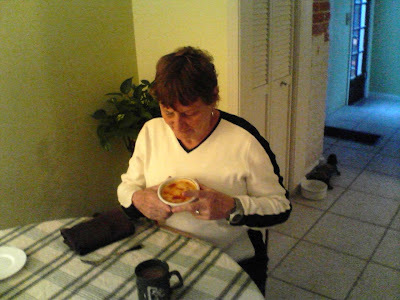 Here's Carolyn coveting her selfish brulee. 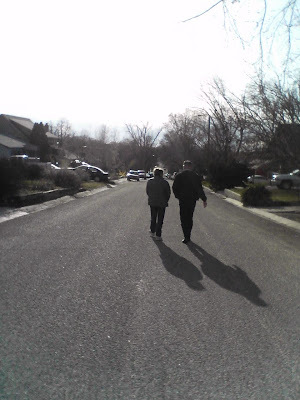 It was fun to walk about town, and there were lots of folks out enjoying the spring sun!